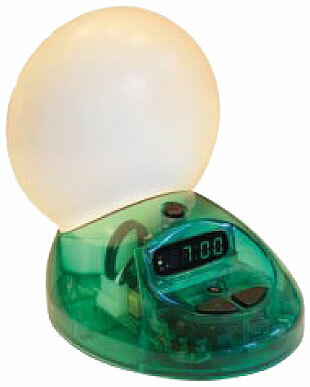 Refurbished SunRise Clock EZ Wake Green | BioBrite, Inc. 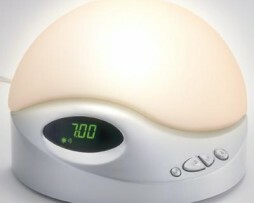 The EZ Wake SunRise Clock™ is the most economical QUALITY dawn simulator on the market. It comes with a fixed 30-minute fade up sunrise and sunset feature (30 minutes is the time cycle most people prefer) and a backup alarm option. 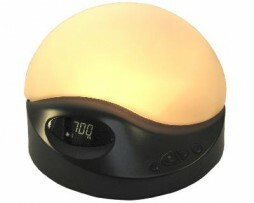 The globe is made of unbreakable polycarbonate plastic and includes a 60-watt bulb that is bright enough to read by. 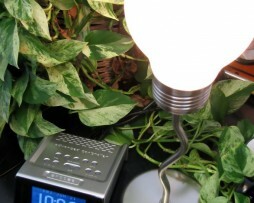 (Note that cheap knockoff products often use very low wattage bulbs that are not effective). The EZ Wake is smaller and has fewer features than its “big brother” SunRise Clocks™, but its ease of use and low price make it a perfect gift for young people. New EZ Wake Clocks have recently gone out-of-stock, so ordering this item will buy you a version in 100% working order but perhaps having minor cosmetic imperfections.